I love dim sum and my best memories of eating dim sum was when i was doing my veterinary studies in Perth. There were many Chinese restaurants there (run by Hong Kees, or Hong Kongers if you like) and a few of us would always gather during weekends to have brunch at one of these dim sum joints. Family members who visited me there were never short of praise of the quality (and price!) of dim sum there. My Papa lurrrrvvveeddd the fried squid especially (there was even once i tapao-ed it back to Singapore for him, when i came home during the semester break), and the hubby simply lurrrvvveeeddd the giant crab cakes. I still remember my favourite dim sum restaurant was "Yummy BBQ" located along Leach Highway. Just a couple of years when i went back to Perth for a holiday with the hubby and Big T, we even brought the little boy there for some bao and cheong fun! You know what i really dig about dim sum in Perth? It's the fresh, succulent whole prawns in their har gows/ shrimp dumplings (虾饺)! The har gows in Singapore just don't make the cut. Tak kana, we say. The ones you get in Singapore either have prawns that are not fresh or prawns that are okay in terms of freshness but small/not succulent. The worst of the lot are the har gows with meat stuffing - these should be renamed meat dumplings (肉饺) instead! Anyway, i digressed. 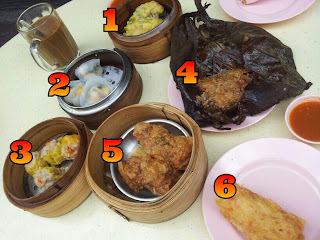 This dim sum stall at Tampines which i'm reviewing in this blogpost is the hubby's favourite breakfast haunt on his off days, after he drops Little T off at his mum's. I've only been here twice, but i think the quality of food is decent and for such good food, i'd say it's really pretty cheap. The 6-dish spread (shown in picture below) costs us only $14.30! According to the hubby and the stall auntie (who knows him because he's a regular there), the hubby only orders 2 dishes when he's here and they are the chives dumpling or 韭菜饺 (See No. 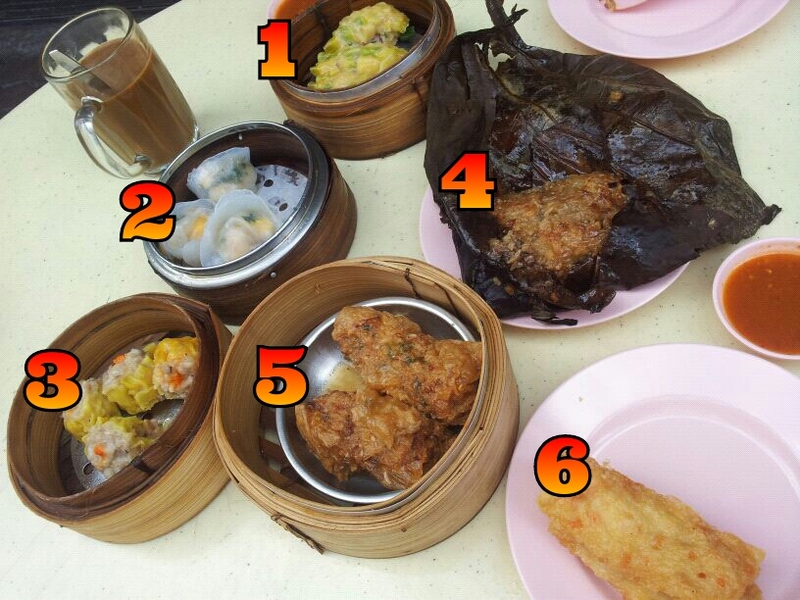 1 on picture above) and the steamed beancurd roll or 鲜竹卷 (See No. 5 on picture above). The hubby was more than happy that i was with him that morning because one more mouth means more food and more variety! 1. Chives Dumpling (韭菜饺): I usually eat this depending on my mood and i don't particularly like or dislike this. I thought this was not too bad and the good thing about it was they didn't use too much fatty meat which would otherwise have made this a very jelat dish. 2. Shrimp Dumplings with Salted Egg Yolk (咸蛋虾饺): The hubby and I loved this! He's never ever noticed this on the menu but he swore that this will become his staple for future visits. They used whole shrimps (not shrimp paste and not mixed with meat, yay!) and the shrimps were fresh and firm, not too big though but i can deal with that on the account of the salted egg yolk. Heh. 3. Siew Mai (烧卖): I'm not usually a siew mai person because i find that many stalls use meat that is wayyyy too fatty! This was a pleasant surprise though because like the chives dumpling, i think they chose to use leaner meat, which doesn't make me sick and is definitely a much healthier choice! 4. Chicken Glutinous Rice/Lor Mai Gai (糯米鸡): Don't like this because of the mushy texture. I think it's because it's been left in the steamer for too long and because of the condensation process, water droplets on the surface of the lotus leaves have seeped inside and caused the rice to become too soggy. I'd rather eat Khong Guan's Lor Mai Gai in the aluminium-foil container any day! 5. Steamed Bean Curd Roll (鲜竹卷): This is the hubby's favourite dim sum dish and i really like this too! As with the other dishes, leaner meat was used - when i scrutinised the ingredients after i took a bite, i could actually see bits of chicken meat and it was not just minced-meat-that-you-can't-tell-what-animal-or-what-part-it-came-from. Nice! 6. Deep Fried Bean Curd Roll (腐皮卷): This was good too (and you can see from the picture that both of us had already devoured most of it by the time the picture was taken). Definitely a must-order the next time i come here. Another thing worth mentioning was the 2 aunties at the stall were really chatty and friendly. The older auntie who served us, after realising on her own accord that she forgot to bring us the mayo for the 腐皮卷, apologised and immediately went back to the stall to get us some. I thought that was a nice gesture which sets her apart from the usual grumpy kopitiam aunties who would snap at you like you owe them money. After the meal, i went back to the stall to take a picture because i wanted to post it on my blog. Told the two aunties my intention, asked both of them to smile for the camera, but the older one ran away and half-covered her face, saying, "不要啦!不要啦!". The younger auntie was also shy but continued to do her work while consciously making sure she was not facing my camera. Haha! If you live in the Tampines or if you just want to indulge in cheap but much better than average dim sum, this is the place to go. It's located at Block 828, Tampines Street 81, New Century Coffee Shop. Go try and let me know what you think!